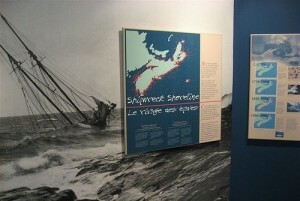 Shipwrecks explained at the Maritime Museum of the Atlantic. Even the most ambiguous of museum-goers shouldn’t miss the Maritime Museum of the Atlantic. Ideally placed on the the waterfront in the heart of historic downtown Halifax, the museum has two big draw cards, both of which are quite moving. Bring a tissue. The story of the ill-fated Titanic, from its construction to the rescue effort off Nova Scotia’s shores, is fully covered. Halifax played a key role in the aftermath of the Titanic disaster and many victims were buried in the city. One of the famous deck chairs is even on display at the museum. Equally emotional is the tale of the Halifax Explosion that largely leveled the city in December, 1917. It was caused when a Belgian ship ran into a French freighter loaded with wartime explosives and remains to this day one of the largest man-made, non-nuclear explosions the world has seen. Also worth checking out are shipwreck treasures, displays on the World War II effort to fight German U-Boats and Joshua Slocum, the Canadian-born mariner who was the first to sail single handedly around the world. Directions: On the Halifax waterfront, 1675 Lower Water Street. Opening hours:Daily between May and October, 9:30am to 5:30pm and Tuesday until 8pm except Sundays in May and October, 1pm to 5:30pm. November to April. Tuesday, 9:30am to 8pm. Wednesday to Saturday, 9:30am to 5pm. Sunday, 1pm to 5:30pm.